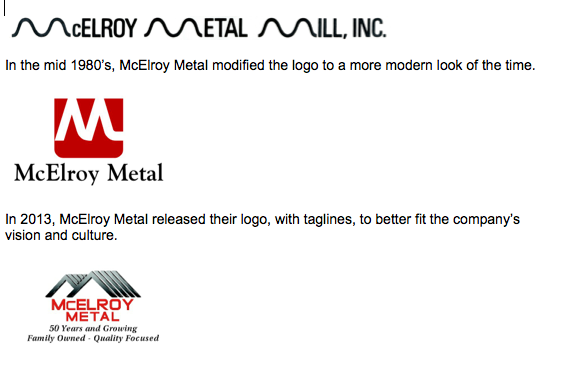 McElroy Metal, celebrating its 50th anniversary in 2013, has released a new logo. Three generations of the McElroy family have guided the company through periods of growth. In 1963, Thomas E. McElroy Sr., known as Mr. Mac, founded McElroy Metal Mill in Shreveport, La. Four years later, the company moved into a new industrial park across the river in Bossier City, a location that still serves as the corporate headquarters as well as the Southwestern Division of McElroy Metal. 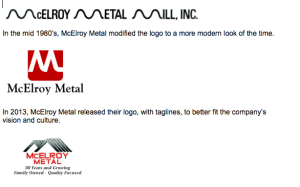 In 1970, Mr. Mac’s son, Tem McElroy, joined McElroy Metal Mill after working as a consultant in the computer industry. One of Tem’s earliest initiatives was implementing the company’s first computer system, interestingly enough, while the senior McElroy was on vacation. Staff members thought computerization was an awful idea and begged Tem to remove the system. He held firm and McElroy Metal Mill entered the computer age. Mr. Mac retired in 1975 and Tem McElroy took over the reins of president. He soon implemented his vision to turn McElroy Metal into a national company. The company’s first satellite manufacturing facility was built and opened in Clinton, Ill., just a year later. Since then, McElroy Metal has expanded to a total of 12 manufacturing facilities via green field or acquisition. Through the years, McElroy added facilities in Peachtree City, Ga. (1979); Marshall, Mich. (1983); Winchester, Va. (1985); Adelanto, Calif. (1990); Lewisport, Ky. (1995); Merkel, Texas (2000); Mauston, Wis. (2003); Ashburn, Ga. (2006); Sunnyvale, Texas (2006); and Houston (2012).